I wish to here say everything I can about my Toshiba T3100. I have two, a T3100 with a 10MB drive, and a T3100/20 with a 20MB drive. Sadly, my T3100/20's PDP gave up the ghost all the sudden, no idea why, plus it's hinge is crushed. The T3100 works well. It had a broken "D" key; I desoldered the mechanism of the key and under it was a diode. For some reason, though the rest of the system was pristine, the diode was totally destroyed with rust; I replaced it with a diode from some old piece of broken toy and now it works fine. 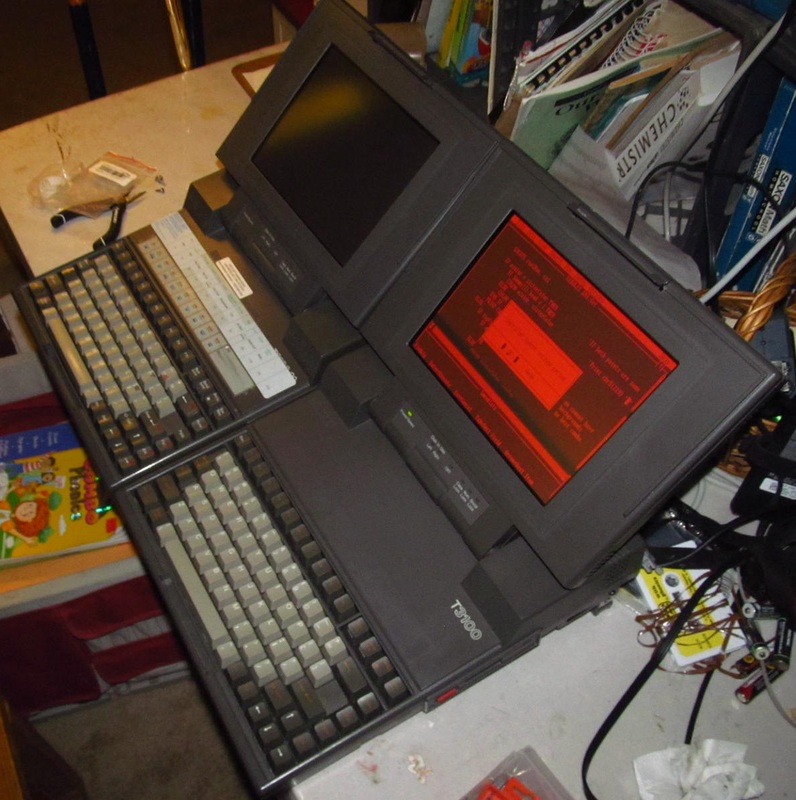 The Toshiba T3100 laptop has no battery except the CMOS backup battery, and the PSU is built into it, making it very heavy, but making it a lot easier to use by posterity as it needs no special charger like the T1200 does. It has a 3.5" FDD, but it only supports 720k FDs, not 1.44m. The specs include an Intel 80286 CPU, 640kb RAM (upgradable to 2.6MB with a very rare proprietary expansion card), and a 640x400 EGA compatible two-color plasma screen. Note that the screen doesn't have varying levels of redness. For connectivity, it has parallel, serial, an EGA port, a proprietary expansion card port (this seems to be compatible with 8-bit ISA cards, I have a picture of my adapter in the picture folder), and oddly enough, an 8-pin mini DIN RS-422 port hidden behind the case, as pictured as well. No idea what one could do with that. The keyboard is mechanical and very very high quality, the key labels are molded in, not printed on. There is a large metal hinge to both carry it with, though this is very akward, and the tilt it up for better keyboard usage. 10MB JVC JD-3812MOTO MFM/RLL HDD/20MB JVC JD-3824ROTO MFM/RLL HDD, Reinforced hinge on the T3100/20, Epson FDD/TÜV FDD, Toshiba BIOS/AMD BIOS chip, red keyboard keys/white keyboard keys. In the T3100 settings are accessible if the CMOS battery dies, but in the T3100/20 it just "sets them to default" and you can never access the settings without a special program sent over on a bootable floppy. I have a folder with a whole bunch of pictures of the whole thing, it can be downloaded here: Toshiba T3100 Images on Dropbox That includes documentation of differences, the key repair, and the disassembly. 1) Remove three screws from bottom. 2) Remove three screws from back. 3) Remove two screws from under the handle. 4) Remove two screws from underneath the PDP (plasma display panel) mask sticker. 5) Unclip and remove the PDP front casing. 6) Unscrew the PDP unit. 7) Take the PDP out, lay it on it's front on the keyboard, and unplug the three cables connecting it to the base. 8.5) Remove the hinges, PDP top casing, and PDP cable cover (the weird round thingy that covers the wires at the hinge). 9) Unclip the top of the bottom case, rout the screen cables out through it, and remove it. 10) Lift the keyboard out and open the clip that holds the keyboard cable in, with a small flathead screwdriver or thin pry tool. 11) Remove three screws from the PSU board shield and remove it. This is where I end, as this time I only needed to replace the keyboard. If you need to replace the keyboard (or backup battery or RAM expansion card), you can also just remove the base screws, unclip the base case clips, and rotate the top 90 degrees so it's mostly out of your way. They actually suggest that in the manual. I think if you've gotten this far you can figure out the rest, but if you want to ask any questions or ask for any pictures, just message me on this forum or visit #caleb or #bosaiknet on EFNet IRC! Last edited by notipa on Mon Feb 29, 2016 7:13 pm, edited 1 time in total.